Photo from Dana Holmstrand at our Government Summit. 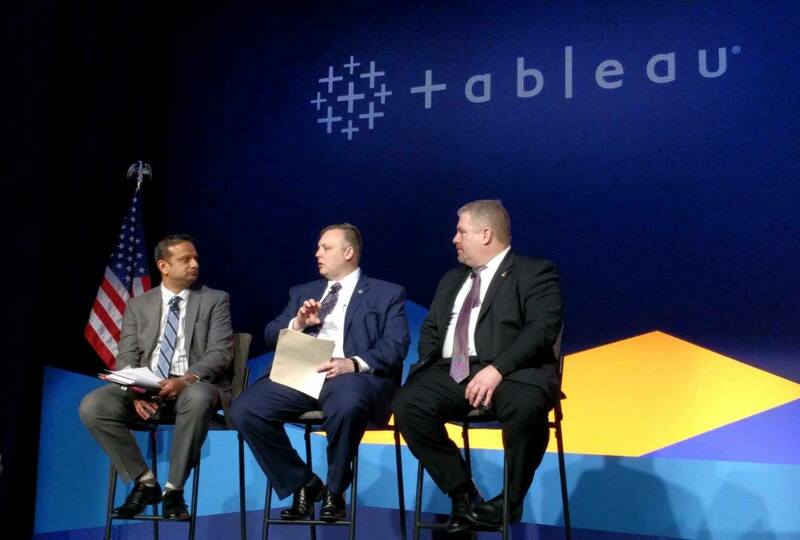 Tableau recently commissioned research with Market Connections that assessed how federal agencies collect, analyze and report their data. The online survey of 200 people was comprised of federal civilian, DoD/military, federal judicial and legislative individuals. More than half of respondents shared that their agencies have multiple data analytic products dispersed across the organization, groups and desktops, and 50 percent cited the top reason for not standardizing on one platform is that people don't want to stop using existing tools. When they see current products creating duplication of efforts, silos of poorly managed data, and confusion around data accuracy, it's no wonder there are hesitations and staff with their guard up. With 2018 underway, the push for federal agencies is how to adapt to the Modernizing Government Technology Act and taking steps to make changes with their tech infrastructure to enhance how they deliver on their mission. More than likely, this has been met with internal concern, though. While some agencies sit in a pool of uncertainty, there is upside and benefits to standardizing on a single data analytics platform. And we discovered that there was recognition of these benefits amongst respondents. For instance: almost 50 percent realize a single analytics platform positively impacts their agency mission and 62 percent share that it provides clearer insights through data visualization. Transitioning from a multi-tool environment where spreadsheets rule to a single analytics platform won't happen overnight, but there are incremental, easy steps that agencies can take to experience a smooth migration. Data has become a lynch-pin to federal agencies being able to prove their progress in complying with legislative mandates on performance such as The DATA Act of 2014 and the Government Performance Results Act of 2010. The bottom line is that it's all about good government: not just making the best decision, but the right one. With the universe of data growing exponentially across all industries, including public sector, adopting business intelligence to tap into the power of it has significant upside. For one thing, it can help an agency achieve an evidence-based policymaking standard and wrangle tough issues like improper payments. Again, our research indicated that some already see the value of having one BI platform. For instance, 42 percent of respondents said it promotes collaboration, and how can you ignore that. Sixty-five percent also recognized that it encourages smart decision-making rooted in fact. Begin with a small group who can dip their toes in and try it out. More than likely, they will see the same benefits as those surveyed and become more willing to walk away from the cumbersome and manual solutions that required considerable time and energy and drained resources. Leveraging an agency's existing data and analytics technology investments is important when other parts of the infrastructure could need an overhaul. That is music to the ears of CFO's and others sitting in IT roles with federal agencies. Select platforms offer a seamless connection between old and new, so we urge agencies to do their homework and choose wisely. With a singular analytics platform in place and in use vs. a collection of tools, IT can focus on bigger issues like data governance, security and compliance, and put power in the hands of users to explore, analyze and report on their data. Additional upside includes: self-service analytics becomes a reality for complex agencies; new perspectives and data sources can be added to better understand what's going on within agency groups; and more confident decisions are made. Migrating from spreadsheets to a data analytics dashboard can have profound impact. People don't typically consume data in rows and columns, so spreadsheets are problematic. As the saying goes, a picture speaks a thousand words. A dashboard delivers the kind of information that quickly lets staff across an agency understand what's going on. It also allows decision-makers to identify trends, patterns and factors that aren't easily revealed in spreadsheets. Data outliers have become trickier to uncover, but with a dashboard, you can defend against the threat of them and more easily surface that one data point. Ultimately, that increases transparency and accountability of agency activities. Plus, the value of seeing and understanding what is happening in real-time when you're moving at the speed of light is critical. To learn more about our findings and implications for government agencies, read our Data Analytics whitepaper.